Home » Just another day in Japan » A Little Radiation Reading With Your Beer? A Little Radiation Reading With Your Beer? 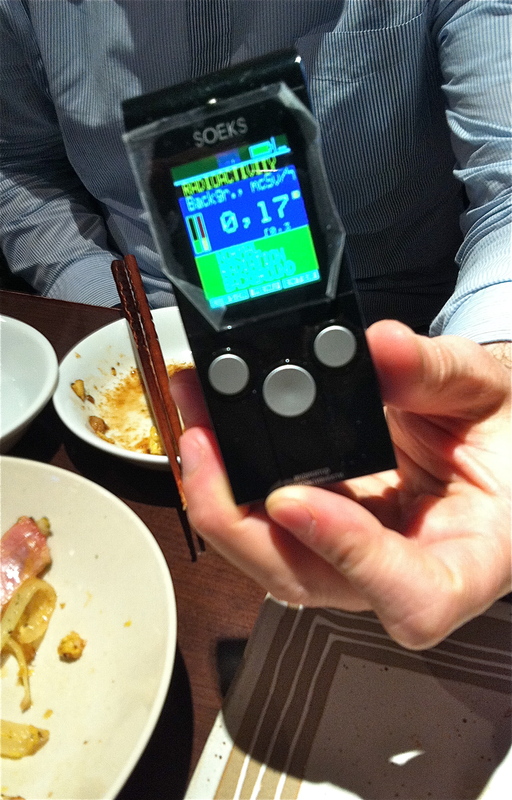 The other night at our end-of term drinking party, my classmate Garry whipped out his pocket Geiger counter to check the radiation levels at the always-excellent Ushitora beer bar in Shimo-Kitazawa. Fortunately, the only reading that was high by the end of the evening was everyone’s blood alcohol level. Garry works for a company that sells these pocket monitors, and they’ve been doing a serious amount of business since hot spots started randomly showing up in Setagaya ward. First there was the one that was explained away as leftover vials of radium abandoned in a basement after a watchmaker dealing in glow-in-the-dark watch faces went out of business, but the most recent one still raises questions. Apparently, these might keep turning up, as wind and rain pick up contaminated material and waft it far afield. Nobody is panicking, but having your own monitoring equipment might well become the latest cool accessory. We’ll know for sure when Louis Vuitton starts selling little leather cases for them. It was so interesting what he was telling us about radiation! And if the made them in mini size which can attach to your phone i will buy them!